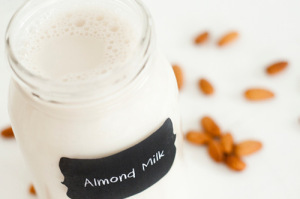 If you haven’t yet caught on to making your own homemade almond milk, this recipe should demystify the process. It is SO easy and the finished product is delicious and well worth it. You’ll want to start off with truly RAW almonds, organic if possible. It’s best to purchase these through farmer’s markets or directly from a grower. 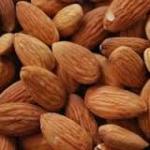 Even though almonds you buy in the stores are packaged and labeled as raw, unfortunately they have been flash pasteurized. The problem with this is that they won’t sprout, which we’ll talk about next. But if you’re having trouble finding your almonds, use Earth Shift Products as a trusted source for truly raw unpasteurized almonds. Soaking raw nuts and seeds has many benefits. In blending, as we do for nut milks, soaking softens the hard texture allowing them to blend easily. Soaking also removes some of the phytic acid from the nuts. I think of phytic acid as an anti-nutrient, so the more we can remove, the better. In order to illustrate this concept, imagine a tiny apple seed. You plant it in the ground, water it, it sprouts, and with proper care it will eventually grow into a full sized apple tree that then produces its own apples. Everything it needed to become a tree was already contained in that tiny little seed. . .quite a miracle. That is the power you harness when you sprout seeds and nuts that you intend to eat (or in this case, drink). You literally harness the enzymes, nutrients and life-giving properties that are dried up inside the seed, turing them into a “living” food source. 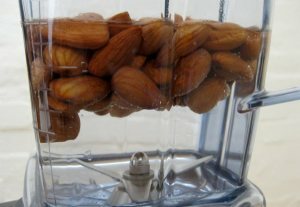 If you soak your nuts long enough, they should get soft enough to blend them in a regular blender. If you have a high-powered blender like a Vitamix or Blendtec, that will work absolutely wonderfully, as these high-powered blenders are made for jobs like this. Once you blend the nuts, you’ll most likely want to strain the liquid through a nut milk bag. These are easy to find on the Internet and look something like this. 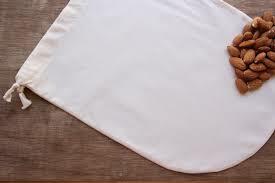 You could also use cheese cloth or a fine strainer if you’re in a pinch. You’ll just want to find a practical way to separate the pulp from the liquid. Rinse almonds (or whatever nuts you’re using) in a colander. Place in a large bowl and cover with water. 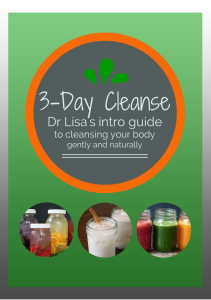 Soak for at least 8 hours or overnight. 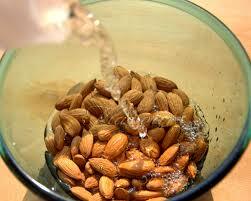 During this soaking/sprouting process, the almonds will swell, soften and possibly even grow a little tail. Dump the water and rinse them again. Place them in the blender along with 4 cups of pure clean water (you can use less if you like a thicker nut milk). Blend thoroughly. 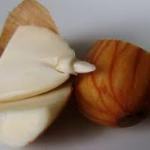 The more you blend, the finer the pulp will be and the more nut milk you will yield. But be careful not to over-blend. When using a high-powered blender like a Vitamix, the blending speed can reach a level to where the temperature can actually cook the live enzymes and nutrients right out. And drinking the live nutrients, aside from the delicious taste, is the whole point of making this healthy nut milk yourself! Strain mixture through a nut milk bag or preferred straining method. This will separate the milk from the pulp. Then if you so desire, return the strained milk to the blender and add any or all of the optional ingredients to taste. Have fun and play around with flavors and sweeteners. The milk is delicious just plain, simple and unsweetened as well.